Want to be interviewed? Want to do an interview? Email me with your ideas! Read more about Food Interviews. Art will give away one of each of his bars to five random commenters - one winner per post. All winners will be drawn on Saturday morning, July 12. All comments are eligible up until the time the winners are posted. While you may leave multiple comments on a post, only one comment per person per post is eligible to win. How did you end up with the 3 main flavors that you have: Ocumare, Madagascar, and Cuyagua? Well the Cuyagua valley and the Ocumare valley were both areas that I’ve been interested in for quite some time and the same goes for the Madagascar. I happen to have come across one particular farm in Madagascar that produced beans that I thought were very special. I grabbed what I could of that. It was something similar with the Ocumare and Cuyagua. Ocumare is a valley right on the coast of Venezuela. They have moderately limited production capabilities as far as cocoa and Cuyagua is not too far from there and they produce significantly less than Ocumare and so the amount of cocoa available from these areas is pretty small. In the end, they have the flavor profiles that I like. That’s how I make chocolate. I have to like it. I found a review from one person comparing our chocolates to somebody else in the industry and they thought that I’d received my inspiration from somebody else. I got a good chuckle about it because I don’t eat that particular chocolate. Nothing against the chocolate maker, it’s just when I’m looking for chocolate, that’s not what I readily reach for. Though it’s a perfectly fine chocolate. What it reminded me so much of was literature classes in school. People say, “Oh the author received inspiration from this source or that source,” when in reality, the author was doing whatever they felt like. When I make chocolate, I make it to how I like and I don’t base it on anybody else out there. I just do it to my particular taste and I truly hope that other people enjoy eating the same sorts of things that I do. Do the different batches taste different? Every year the crop is different and that could be either good or bad depending on the weather and other circumstances of the plantation. A lot of your commercial chocolates made by the large chocolate companies try to make things in such a way that you end up with consistency from year to year and batch to batch. For me, I call that the Peter Principle of chocolate. If you’ve ever seen the book on the Peter Principle, it talks about people rising to the highest level of mediocrity and I think it that tends to be what happens. You end up with the situation where when something comes along that is truly great and special, it has to be treated in a way that lowers its quality rather than lets it shine. What we try to do is to let every batch speak for itself and just try to really let it shine to the best of its ability. Because of that, there are going to be variations from year to year and even batch to batch. For that matter, in our beans that we get from Madagascar, we see a sizable variation from bag to bag. We see that from beans we get from other locations as well. When we are making each batch of chocolate, we need to be really cognizant of the flavor difference and where we want to take it. Is lack of consistency a problem when trying to sell a consumer good? The flavor won’t be totally different. It will be fairly similar, but there will be flavor differences in lots. Rather than trying to bring a lot down to meet a specific specification, what we try to do is let each lot be the very best it can. It can be very complicated at times because you have to be really cognizant as to the flavor differences from bag to bag and how that will affect the batch as a whole. You also have to be cognizant of the fact that a lot of the flavor changes that you see are not going to necessarily really show up until three or four steps down in the process. During manufacturing, you have to modify the practices and every time you do so, you have to have a vision of where you are going five steps down the road because how you treat something at one point may not affect the flavor immediately but it will affect the flavor at the end point. It gets to be rather complicated. Sometimes you just have to sit in a quiet room for a while and ruminate on it until you see the path you want to take. Have you thought about producing flavored chocolate? We are all about chocolate. There may be flavored chocolate that we may do in the future. I don’t see that happening for a number of years, mainly because we try to select the world’s greatest cocoa beans and let them really speak for themselves. As much as we respect those that want to flavor their chocolate, that’s not for us at any point in the near future. I’m never going to say we are never going to do it, you never know. I think a lot of the flavored chocolates that you see are created because of the fact that most chocolate companies in the world buy their chocolate from another manufacturer. If everyone is buying their chocolate from three or four or five major companies and another handful of smaller companies, the way they have to differentiate themselves it is to do things like flavoring their chocolate. At the same time, there is a great historical tradition of flavoring chocolate going all the way back to Montezuma, if not earlier. If somebody wants to flavor their chocolate, from my perspective, that’s fine, but I hope that our chocolate is good enough that no one is tempted to do that or to feel that it is needed. I do not have a favorite. Isn’t that terrible? It’s like when you have kids and you end up not having a favorite kid. You might be tempted to, but you just don’t and it’s not a matter of being politically correct (don’t know if that’s quite the right word), but just not wanting to select one. It’s just a matter of the fact that you see the beauty and the talent and the positive attributes of each of your children and it holds the same for your chocolate. Each one of our bars that we’ve released so far stands up very well on its own and has its own unique characteristics. As to which one I’ll reach for at any given time, it is entirely dependent on my mood. It never struck me before, but makes perfect sense after reading this. Chocolate has similarities to the wine industry. If each finished chocolate is coming from a specific farm, there are going to be variations in flavor from year to year. The large chocolate companies are producing a generic blend rather than a specific vintage. I hope that someday I find a true passion for my work like this. I love that he compares these three chocolates to his children. It seems that his attitude is right along these lines...give them lots of love and help them be the best they can be, and everything will turn out right. Makes sense to me. I am going to have to try these asap! D. -- Yes, I have no particular favorite. I believe all of our bars are exceptional -- though in very different ways. The Ocumare is rich and complex with some beautiful fruity notes. The Cuyagua (from two valleys over) is much less fruity and more spicy (though not in the same sense as that of people who add chilies and other spices to their chocolate.) This is caused by Cuyagua being more remote from the already remote Ocumare and not having as much cross breading that causes some of the fruity notes. Madagascar is a wonderful example of how fruity chocolate can be and is truly loved by pastry chefs. They all have their wonderful attributes and it truly depends on my mood as to which I'd choose at any point in time. I like the personal touch,but it can be hard finding teh right chocolate fo you. If chocolate is like wine, does it get better as it ages?? Jenn Kim: Yes. To a certain degree, chocolate does get better as it ages. Especially during the first three weeks after manufacture, the chocolate mellows and the flavors become more well rounded. I have had test batches of beans that I have done for example where I was not at all happy with the test batch when it was immediately completed but the finished chocolate was wonderful 3 weeks later. The aging process continues for about six months after which, it tapers off. Some have noted that there is a peak for some bars (as with wine) at which point the flavor is best but unfortunately, there really isn't any way to predict that and it varies depending on the beans used, formulation, etc. In response to chuck, yes, chocolate and wine are similar like that. Funnily enough, chocolate has a lot of similarities to the beer industry as well. It seems strange when you think about it. The different names of the chocolates are very interesting and unique -- definitely better than a plain old Hershey's bar... I'm going to have to try these! Now you introduce art and literature to the equation. I'm swooning! I do admire the blend of science and art, creativity and earth's bounty in the production of fine wine or artisan chocolate. I'm always impressed by how much work and passion great chocolate makers put into making their chocolate. Art is no exception. WE definitely consume too much chocolate around our house. 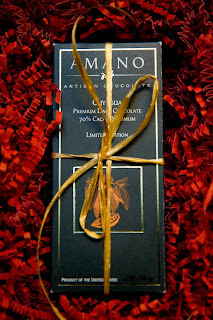 Have never heard of Amano, where can I buy it in the San Francisco area? mmmmmm, fine chocolate. I wouldn't have it any other way! So you don't 'add' flavors to the chocolate, but the description of each bar is what is inherent in the beans from that region? Yes, the flavor differences between the bars are almost entirely dependent on the beans we are using to make that bar. How we process the beans can vary from bar to bar slightly because each bean is different and how you bring out the optimal flavor for each bean is different so our "recipe" if you will changes slightly but no, we aren't into adding flavors to things unless we have very specific reason to. We don't want to get caught up into the "let's flavor chocolate" fad. Sounds delicious. I like how you concentrate on the chocolate rather than the flavor. All three sound great from your description in the post. This is really interesting! I'm curious - how big is a "batch?" If someone was regularly consuming your chocolate, would the flavor be changing day-to-day, or does a batch of bars last for longer? I love the idea of not making flavored chocolate, & just letting the natural chocolate taste be the star. And I'm amazed that you don't have a favorite, but it makes sense! I love that Art only makes a chocolate that he likes. Kind of like Stef and the mint and peanut butter ban on cupcakes. I agree you need to like and enjoy what you are making.